In this tutorial we will review all steps of the manual installation for the SMF application. This tutorial includes the download of the installation package, creation of a database and overview of the whole installation process. 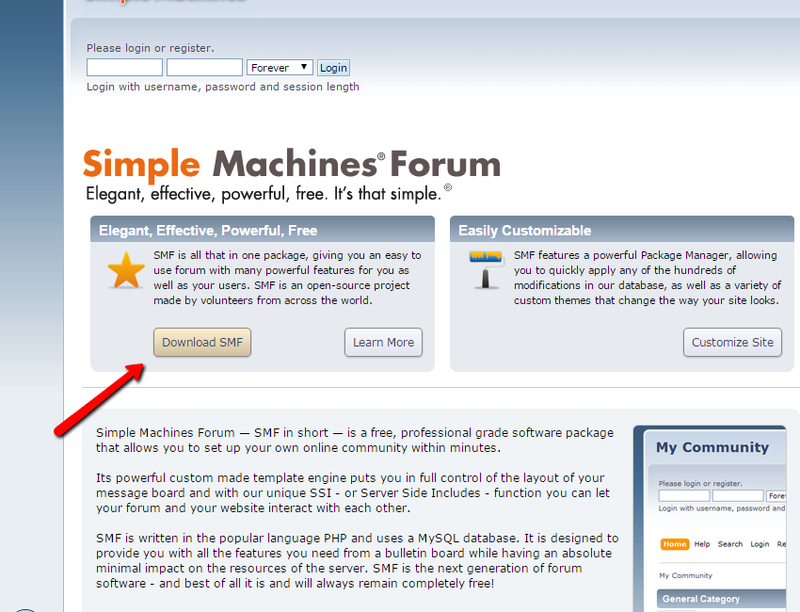 The first thing to do is to download the latest stable release of SMF.You will need to access the official page of Simple Machine Forum and download the installation package. Once the package is downloaded on your local computer you should extract the archive. This will create a folder that contains all of the files you need for the new SMF installation. In order to upload the files on your hosting account with us you will need to connect to it with your favorite FTP client. 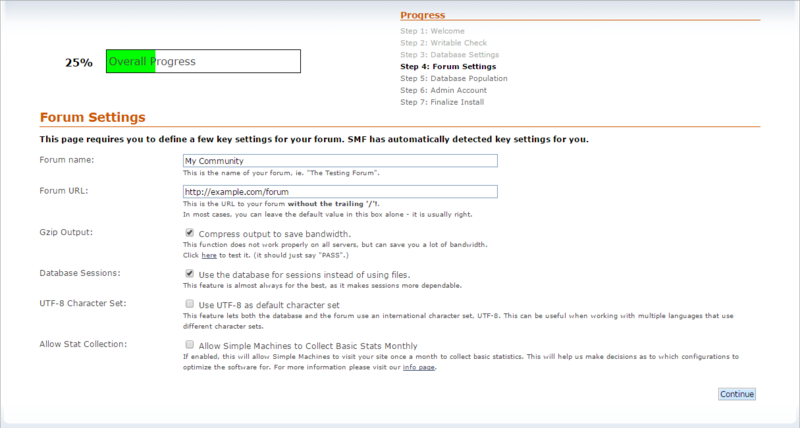 After you connect successfully to your account with us you will need to upload the files of SMF in the public_html directory. If you would like the application to be in subdomain (subdomain.example.com) or subfolder (example.com/subfolder) you should upload the files in the relevant folder. Select all of the files then right click on them and choose to Upload in order to initiate the upload process. After all of the files are uploaded successfully we can initiate the actual installation by accessing by URL the directory where the files are uploaded. The installation process is divided into 7 steps. After you press the Continue button in right lower corner of the page the installation script will skip Step 2 because our servers are configured properly for the installation of the SMF application. On the following Step 3 we will configure the database connection. 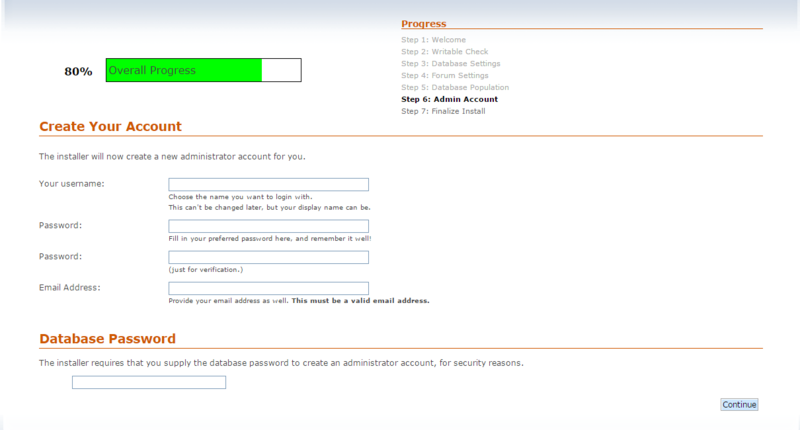 In order to fill the Username, Password and Database name fields you will need to create a database. After all of the fields are properly filled you should press the Continue button in the right corner on the bottom of the page. 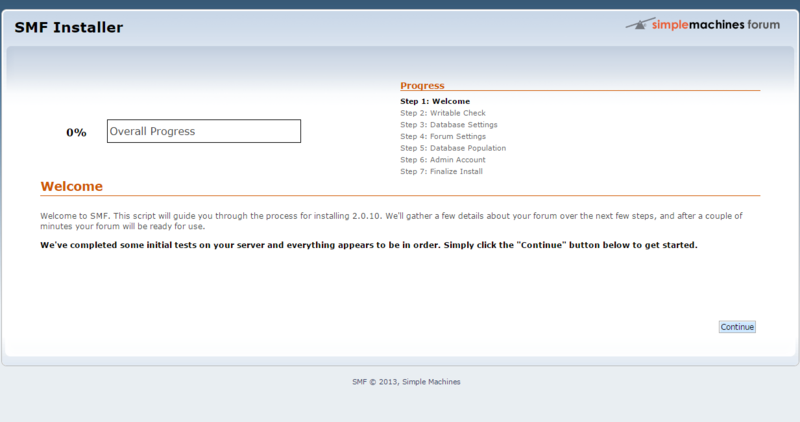 On the next page we are on Step 4 and we will define a few settings for the forum. 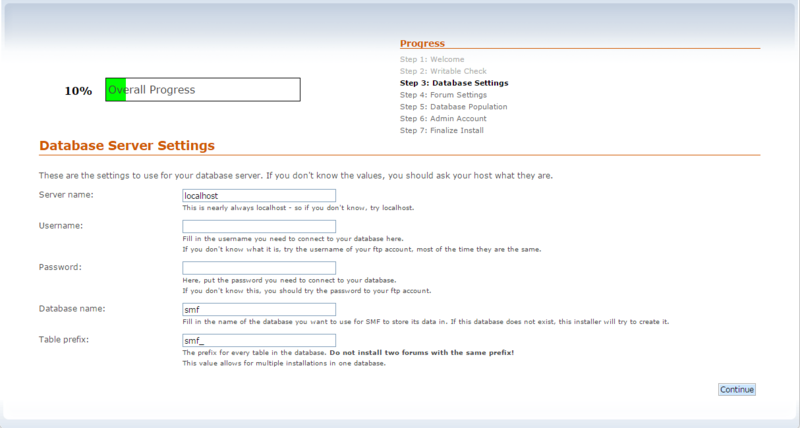 On the other section of the page which is called Database Password you need to enter the same password as you have entered in Step 3: Database Settings for the user with all privileges on the database in use by the application. After both of the sections are filled with the required data we should press the Continue button on the bottom of the page. 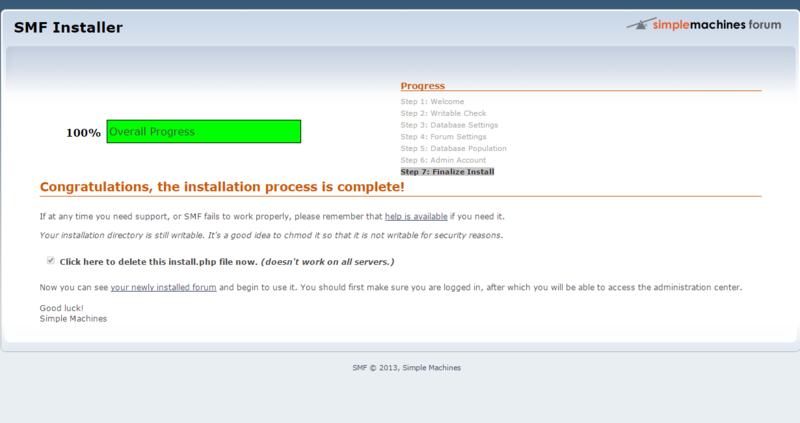 The next page is the Step 7: Finalize Install. You should press the Click here to delete this install.php file now. (doesn't work on all servers.) checkbox. You can ignore the text in the brackets because our servers are configured properly for the Simple Machines Forum application. If you click on the your newly installed forum link it will redirect you to the index page of your application for example, where you and your users will be accessing the application. 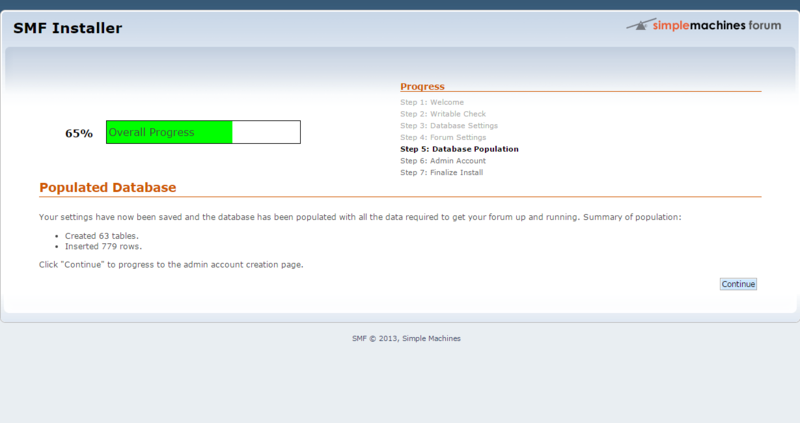 Congratulations, you have successfully installed the Simple Machines Forum application manually.